LEWISTON - Ruth Wells Baxter, 101, passed peacefully in God's loving embrace on Saturday, Jan. 19, 2019, following a gradual and gentle decline. 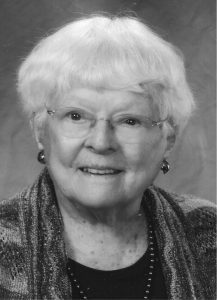 LEWISTON – Ruth Wells Baxter, 101, passed peacefully in God’s loving embrace on Saturday, Jan. 19, 2019, following a gradual and gentle decline. Her daughter, Marcia, was by her side in the loving home Ruth had shared with Marcia and her supportive husband, Bruce Damon, since 2008. Ruth was born at home in Bakersfield, Vt., on Nov. 22, 1917, to Arthur and Elsie Camp Wells. Throughout her life and wherever she lived, she was proud to be a Vermonter. Especially in later years, Ruth enjoyed sharing stories of her happy childhood. She graduated from Bakersfield’s Brigham Academy in 1934, and most who knew her learned that Bakersfield native Peter Bent Brigham founded both this academy and Peter Bent Brigham Hospital (now Brigham and Women’s in Boston). A country girl, Ruth traveled by train to Boston and graduated from the New England Deaconess Hospital School of Nursing in 1939. While in nursing school, she met her husband, Ferd C. Baxter, from Cape Cod. They married on Oct. 19, 1941, in Bakersfield, Vt.
Their 49 wonderfully happy years of marriage (until his untimely death in 1990), included homes in Waltham and Dedham, Mass., followed by retirement years in the Baxter family home in West Dennis, Mass., and winters in Fort Myers, Fla. Together they enjoyed raising their only child, traveling, camping, gentle hiking, sharing “slide shows” (photography), being with friends and family, and simply being together. In her early nursing career, Ruth worked at The N.E. Deaconess Hospital. She later worked as a visiting nurse for the Brookline Friendly Society and the Dedham Visiting Nurse Association, as a “floor nurse” at the Waltham and the Norwood Hospitals, and as supervisor at the Dedham and West Roxbury Nursing Homes. Ruth also cared for her elderly parents for many years in her Dedham home. During these years she assisted her mother Elsie Camp Wells in completing her town history book about Bakersfield, Vt., published in 1976. Throughout her long life, Ruth loved nature, wild flowers, family reunions, letter-writing, reading, volunteering, Vermont maple syrup, rug-hooking, gardening, crafts, making “memory books,” and the companionship of a family cat (for the past 11 years, her devoted Oreo). While in Dedham, she enjoyed being a Camp Fire leader and holding leadership positions in the United Methodist Women and D.A.R. She also was a loyal supporter and member of many conservation and humanitarian organizations. Membership in a church community was always an important part of Ruth’s quiet faith and brought her lifelong friendships. She was raised and married in Bakersfield’s Congregational Church. Subsequently, she belonged to: Immanuel Methodist in Waltham, St. John’s Methodist in Dedham (wonderful memories), Faith Methodist in Fort Myers, West Dennis Community Church, and lastly the United Methodist Church in Auburn. Her family is filled with gratitude for Ruth’s long and fortunate life and for the lessons she taught by example: compassion, empathy, service, thrift, acceptance, humility, strength, grace in aging, selflessness, and contentment. She and Marcia shared a special bond and comfortable companionship. Ruth also treasured friendships with her Deaconess nursing classmates and the love of her large extended Camp and Wells families. She looked forward to visits to Vermont and Cape Cod (just this past fall). In living more than a century, Ruth marveled at how the world had changed. She remained interested in family and world news. When asked about the secret to her longevity, she usually described her healthy living or replied “It’s the good thoughts I think.” No doubt, her easy-going, non-judgmental nature played a part. Her family also thanks her medical providers whose excellent care contributed to Ruth’s long and healthy life and peaceful passing. Special thanks to Jeri Wade, FNP, Sarah Skelton, M.D., and others at Family Health Associates; Neil Duval, M.D. ; and Beacon Hospice for their care. Ruth was predeceased by her beloved husband; her dear parents, her sadly-missed siblings (Lynford Wells, Dorothy Plante, Esther Kenney) and their spouses; 27 first cousins, and her best friend, Faith Whitney Palmer. She is survived by her loving daughter, Marcia Baxter (husband Bruce Damon); her three cherished grandchildren: Kate Damon (Bill Denney), Laura Damon-Theriault (Jean-Luc Theriault) and Jonathan Baxter Damon; and four entertaining and deeply-loved great-grandchildren: Eliza Mae Denney, Charlotte Ruth Denney, Neika Elsie Theriault and Eliot Clifford Theriault. Ruth also leaves nieces, nephews, a large extended family, and friends who will miss her. As she wished, there will be a family graveside service on Cape Cod this spring. Condolences and memories may be shared directly with her family.